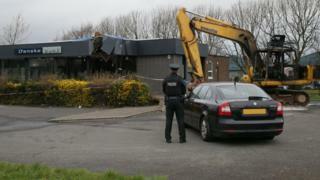 Thieves have used a digger to remove a cash machine from the wall of a bank building in County Antrim. Police said the incident at the Danske Bank branch on Mallusk Road in Newtownabbey happened at about 03:10 GMT on Friday. The digger is believed to have been stolen from a business a short distance away, said police. They added that it was set on fire at the scene immediately after the theft. Police have appealed for information about the incident. Danske Bank said its Mallusk branch would be closed "until further notice". "We are working closely with the PSNI on their investigation and are working to reopen our branch as soon as possible," it added. Retail NI chief executive Glyn Roberts said the robbery was "disgraceful" and urged businesses that have an external ATM to be "vigilant, particularly if they are near building sites with diggers". "Retail NI would also urge building contractors to review the security of their sites," he added. "The criminal gangs behind these attacks need to be caught and put in jail for a very long time."